Opinion piece, burglary in progress scenario! You see this guy on CCTV breaking into a building that you are guarding. Its a weekend and you are on your own. What do you do? This demands an immediate response! The burglar is armed! And masked! Shows premeditation! The obvious answer is to call the police, and yes, you should. If you have a personal attack button linked to a police response, push it immediately. OK, you have a button and you pushed it. The police are on their way but at the moment they don’t know what they will be dealing with. Second case, you don’t have a button linked to the police. You need to call them. In both instances, with or without the button, you need to call the police. That crowbar is a potentially lethal weapon. It can be used as a club. The hidden end probably has a point that can be used to stab. Anyone using such a tool on a ‘job’ can be considered to be pretty committed to achieving their aim. Although a call to the police is needed the first consideration is your own safety. 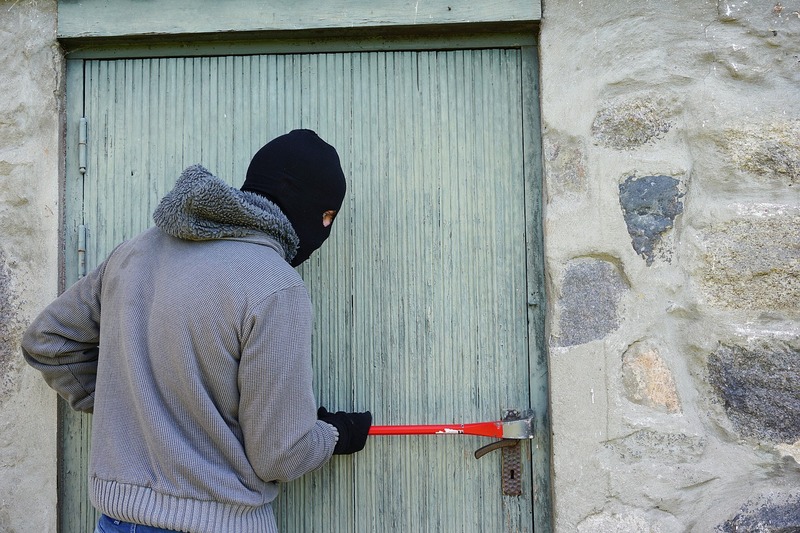 It may be that you need to leave the site and call the police from a safer location. Everyone has a mobile phone these days. Its perfectly possible to start the call and speak to the emergency operator while moving to a safe zone. Its a judgement call as any distraction while moving, especially in a stressful situation, increases your risk of trip or fall! We will cover calling the emergency services in more detail in another post. For the purposes of this scenario however it is imperative that you inform the emergency operator that the burglar is armed with a long metal crowbar. Don’t be surprised if the decision to deploy an armed police response is made. In one incident that I’m aware of a group of youths were attempting to break into a storage area using a metal pole. This information was passed on to the emergency operator. An armed response unit was dispatched and armed officers made the arrest, supported by their unarmed colleagues. NEVER put yourself at risk in situations like this. If you have to delay the call to the police while you go to a safer space then so be it. Over the years I’ve regularly used this scenario as a paper exercise with colleagues. Everyone said call the police, thats good! Very few gave the appropriate consideration to their own safety first before making the call. That’s not so good! Calling the emergency operator does not lead to an instant response. You can also expect to spend a few minutes on the line to them giving information and answering additional questions. During this time the burglar is still active. And remember, when seconds count, the police are only ever minutes away! That is not a criticism of the police, thats just a simple observation. You may have to deal with numerous intruders over the course of your career. Be clear: Your aim is to go home safely! The police are the proper people to deal with such situations. They have the resources and training to detain intruders. You do not! Make sure that you are safe, make the call!